A discussion with Padre Melo on the ongoing Human Rights Violations and the Struggle of the Hinduran people under the continuation of the coup. 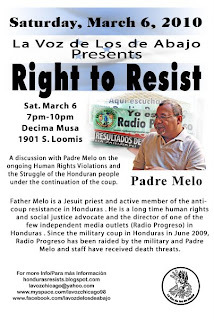 Father Melo is a Jesuit priest and active menber of the anti-coup resistance in Honduras. He is a long time human rights and social justice advocate and the director of one of the few independent media outlets (Radio Progreso) in Honduras. Since the military coup in Honduras in June 2009, Radio Progreso has been raided by the military and Padre Melo and staff have received death threats.